Product information "Hoover GL1108 Globe Vacuum Cleaner"
Globe is the most highly manoeuvrable multi-cyclonic upright vacuum cleaner from Hoover. Designed with innovative Twist and Steer Technology, the Globes pivot action control glides around and under furniture in your home with ease. With a telescopic handle that retracts into the body of the vacuum cleaner, Globe is extremely easy to store. This space saving design is ideal if you need to store your vacuum cleaner under a shelf or in any cupboard with restricted height. This Globe multi-cyclonic bagless vacuum cleaner features advanced no-loss-of-suction technology. This gives constant powerful dust pick-up and reduces the need to continuously clean the filter. 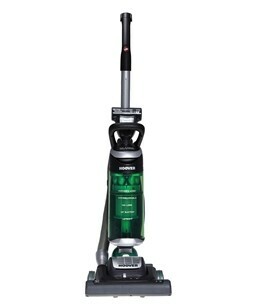 Despite its compactness, this Globe vacuum cleaner has an extra long 7m cord and 4.5m hose. This means you can vacuum a full 13-flight staircase in one go. Related links to "Hoover GL1108 Globe Vacuum Cleaner"
Customer evaluation for "Hoover GL1108 Globe Vacuum Cleaner"